Robert Bowyer (bap. 18 June 1758 – 4 June 1834) was a British miniature painter and publisher. Bowyer sought to illustrate every aspect of the Bible world by hunting all over Europe and Britain for appropriate images. Deeply religious, they were sometimes pilloried. 12 He warned them sternly not to make him known." After this, Christ goes back home again. 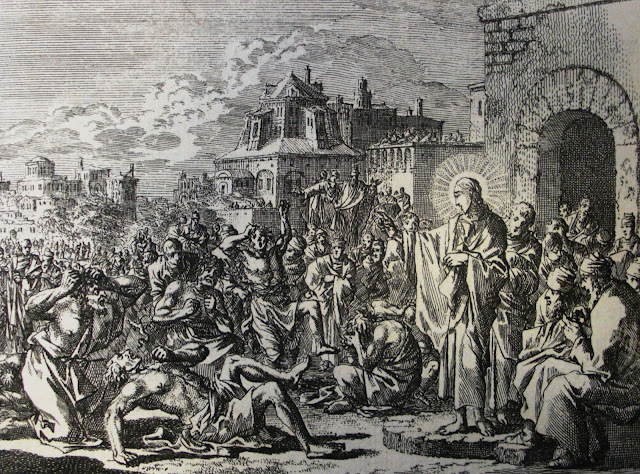 But although he is mobbed, he receives a hostile reception from his family and the scribes. His family do not recognise him as the Messiah and thought he had become insane. "20 He came home.Again [the] crowd gathered, making it impossible for them even to eat. "31 His mother and his brothers arrived. Standing outside they sent word to him and called him. 34 And looking around at those seated in the circle he said, “Here are my mother and my brothers. One can only imagine the reaction to these words. "And a sword will pierce your very soul"
It would have felt like it. Those who consider that Jesus is an agent of the Devil, rather than God, are warned of the danger of never being forgiven (the Sin against the Holy Spirit). The disciples, on the other hand, are pronounced members of Jesus' family, members of the family of God, and this because they do God's will. But it should be noted that the family members have not included "father" as Joseph had obviously died well before the commencement of Jesus' ministry. Yet, Jesus continues the family description without "father", since the father of this new family of brothers is God himself. "We can understand, I think, very well the attitude and words of Mary, yet we still find it very hard to understand Jesus' answer. In the first place, we don't like the way he addresses her: “Woman”. Why doesn't he say: “Mother”? But this title really expresses Mary's place in salvation history. It points to the future, to the hour of the crucifixion, when Jesus will say to her: “Woman, behold your son. Son, behold your mother” (cf. Jn 19:26-27). It anticipates the hour when he will make the woman, his Mother, the Mother of all his disciples. On the other hand, the title “Woman” recalls the account of the creation of Eve: Adam, surrounded by creation in all its magnificence, experiences loneliness as a human being. Then Eve is created, and in her Adam finds the companion whom he longed for; and he gives her the name “woman”. In the Gospel of John, then, Mary represents the new, the definitive woman, the companion of the Redeemer, our Mother: the name, which seemed so lacking in affection, actually expresses the grandeur of Mary's enduring mission. Yet we like even less what Jesus at Cana then says to Mary: “Woman, what have I to do with you? My hour has not yet come” (Jn 2:4). We want to object: you have a lot to do with her! It was Mary who gave you flesh and blood, who gave you your body, and not only your body: with the “yes” which rose from the depths of her heart she bore you in her womb and with a mother's love she gave you life and introduced you to the community of the people of Israel. But if this is how we speak to Jesus, then we are already well along the way towards understanding his answer. Because all this should remind us that at the incarnation of Jesus two dialogues took place; the two go together and blend into one. First, there is Mary’s dialogue with the Archangel Gabriel, where she says: “Let it be with me according to your word” (Lk 1:38). But there is a text parallel to this, so to speak, within God himself, which we read about in the Letter to the Hebrews, when it says that the words of Psalm 40 became a kind of dialogue between the Father and the Son, a dialogue which set in motion the Incarnation. The Eternal Son says to the Father: “Sacrifices and offerings you have not desired, but a body you have prepared for me ... See, I have come to do your will” (Heb 10:5-7; cf. Ps 40:6-8). The “yes” of the Son: “I have come to do your will”, and the “yes” of Mary: “Let it be with me according to your word” . This double “yes” becomes a single “yes”, and thus the Word becomes flesh in Mary. In this double “yes” the obedience of the Son is embodied, and by her own “yes” Mary gives him that body. “Woman, what have I to do with you?” Ultimately, what each has to do with the other is found in this double “yes” which resulted in the Incarnation. The Lord’s answer points to this point of profound unity. It is precisely to this that he points his Mother. Here, in their common “yes” to the will of the Father, an answer is found. We too need to learn always anew how to progress towards this point; there we will find the answer to our questions. If we take this as our starting-point, we can now also understand the second part of Jesus' answer: “My hour has not yet come”. Jesus never acts completely alone, and never for the sake of pleasing others. The Father is always the starting-point of his actions, and this is what unites him to Mary, because she wished to make her request in this same unity of will with the Father. And so, surprisingly, after hearing Jesus' answer, which apparently refuses her request, she can simply say to the servants: “Do whatever he tells you” (Jn 2:5). Jesus is not a wonder-worker, he does not play games with his power in what is, after all, a private affair. No, he gives a sign, in which he proclaims his hour, the hour of the wedding-feast, the hour of union between God and man. He does not merely “make” wine, but transforms the human wedding-feast into an image of the divine wedding-feast, to which the Father invites us through the Son and in which he gives us every good thing, represented by the abundance of wine. The wedding-feast becomes an image of that moment when Jesus pushed love to the utmost, let his body be rent and thus gave himself to us for ever, having become completely one with us - a marriage between God and man. The hour of the Cross, the hour which is the source of the Sacrament, in which he gives himself really to us in flesh and blood, puts his Body into our hands and our hearts, this is the hour of the wedding feast. Thus a momentary need is resolved in a truly divine manner and the initial request is superabundantly granted. Jesus' hour has not yet arrived, but in the sign of the water changed into wine, in the sign of the festive gift, he even now anticipates that hour. Jesus’ “hour” is the Cross; his definitive hour will be his return at the end of time. He continually anticipates also this definitive hour in the Eucharist, in which, even now, he always comes to us. And he does this ever anew through the intercession of his Mother, through the intercession of the Church, which cries out to him in the Eucharistic prayers: “Come, Lord Jesus!”. In the Canon of the Mass, the Church constantly prays for this “hour” to be anticipated, asking that he may come even now and be given to us. And so we want to let ourselves be guided by Mary, by the Mother of Graces of Altötting, by the Mother of all the faithful, towards the “hour” of Jesus. Let us ask him for the gift of a deeper knowledge and understanding of him. And may our reception of him not be reduced to the moment of communion alone. Jesus remains present in the sacred Host and he awaits us constantly. Here in Altötting, the adoration of the Lord in the Eucharist has found a new location in the old treasury. Mary and Jesus go together. Through Mary we want to continue our converse with the Lord and to learn how to receive him better. Holy Mother of God, pray for us, just as at Cana you prayed for the bride and the bridegroom! " "Invited to leave everything to follow Christ, you, consecrated men and women, no longer define your life by family, by profession or by earthly interests, and you choose the Lord as your only identifying mark. Thus you acquire a new family identity. The divine Teacher's words apply particularly to you: "Here are my mother and my brethren" (cf. Mk 3: 35). The invitation to renunciation, as you know well, is not meant to leave you "without a family" but to make you the first and distinctive members of the "new family", a witness and prophetic example for all whom God wishes to call and bring into his house. Dear friends, at every moment of your life may the Virgin Mary be close to you as an example and support. Simeon disclosed to her the mystery of the Son and the sword that would "pierce through your own soul also" (Lk 2: 35)"
"This same shift into the sphere of spiritual values is seen even more clearly in another response of Jesus reported by all the Synoptics. When Jesus is told that "his mother and brothers are standing outside and wish to see him," he replies: "My mother and my brothers are those who hear the word of God and do it" (cf. Lk. 8:20-21). This he said "looking around on those who sat about him," as we read in Mark (3:34) or, according to Matthew (12:49), "stretching out his hand towards his disciples." Now, when Jesus left Nazareth and began his public life throughout Palestine, he was completely and exclusively "concerned with his Father's business" (cf. Lk. 2:49). He announced the Kingdom: the "Kingdom of God" and "his Father's business," which add a new dimension and meaning to everything human, and therefore to every human bond, insofar as these things relate to the goals and tasks assigned to every human being. Within this new dimension, also a bond such as that of "brotherhood" means something different from "brotherhood according to the flesh" deriving from a common origin from the same set of parents. "Motherhood," too, in the dimension of the Kingdom of God and in the radius of the fatherhood of God himself, takes on another meaning. In the words reported by Luke, Jesus teaches precisely this new meaning of motherhood. Is Jesus thereby distancing himself from his mother according to the flesh? Does he perhaps wish to leave her in the hidden obscurity which she herself has chosen? If this seems to be the case from the tone of those words, one must nevertheless note that the new and different motherhood which Jesus speaks of to his disciples refers precisely to Mary in a very special way. Is not Mary the first of "those who hear the word of God and do it"? And therefore does not the blessing uttered by Jesus in response to the woman in the crowd refer primarily to her? Without any doubt, Mary is worthy of blessing by the very fact that she became the mother of Jesus according to the flesh ("Blessed is the womb that bore you, and the breasts that you sucked"), but also and especially because already at the Annunciation she accepted the word of God, because she believed it, because she was obedient to God, and because she "kept" the word and "pondered it in her heart" (cf. Lk. 1:38, 45; 2:19, 51) and by means of her whole life accomplished it. Thus we can say that the blessing proclaimed by Jesus is not in opposition, despite appearances, to the blessing uttered by the unknown woman, but rather coincides with that blessing in the person of this Virgin Mother, who called herself only "the handmaid of the Lord" (Lk. 1:38). If it is true that "all generations will call her blessed" (cf. Lk. 1:48), then it can be said that the unnamed woman was the first to confirm unwittingly that prophetic phrase of Mary's Magnificat and to begin the Magnificat of the ages. If through faith Mary became the bearer of the Son given to her by the Father through the power of the Holy Spirit, while preserving her virginity intact, in that same faith she discovered and accepted the other dimension of motherhood revealed by Jesus during his messianic mission. One can say that this dimension of motherhood belonged to Mary from the beginning, that is to say from the moment of the conception and birth of her Son. From that time she was "the one who believed." But as the messianic mission of her Son grew clearer to her eyes and spirit, she herself as a mother became ever more open to that new dimension of motherhood which was to constitute her "part" beside her Son. Had she not said from the very beginning: "Behold, I am the handmaid of the Lord; let it be to me according to your word" (Lk. 1:38)? Through faith Mary continued to hear and to ponder that word, in which there became ever clearer, in a way "which surpasses knowledge" (Eph. 3:19), the self-revelation of the living God. Thus in a sense Mary as Mother became the first "disciple" of her Son, the first to whom he seemed to say: "Follow me," even before he addressed this call to the Apostles or to anyone else (cf. Jn. 1:43)."